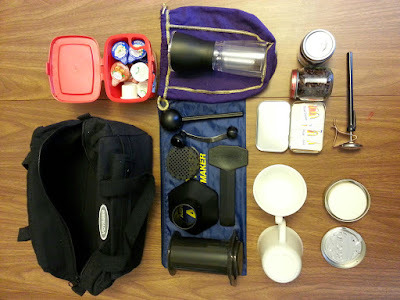 I wanted a Portable Coffee Kit for camping and traveling. This is what I came up with. This is smaller and easier to clean than a french press and its possible (abiet small) to make the same tasting coffee or something much different as you can use an espresso grind with this device. From all the research I did about all different kinds of machines, this is the most versatile for any situation or place, just need hot water. So I really like french press coffee and if you do too then this is for you. Coleman portable propane powered coffee maker - Can't use or probably shouldn't use in RV. Reviewers said machine was slow to make coffee. Coleman stovetop coffee maker - couldn't tell if you could get Stainless Steel Carafe to fit, glass isn't what I want. Stainless steel Moka pot - Reviews said coffee is very harsh flavoured, Can't help but this this would taste close to a percolator. I Think I will add Cinnamon in a Tic-Tac box for a flavour to add when using a non flavoured creamer. I also found that this bag is quite stuffed and things might fit better if I put a grinder inside the aeropress and not the scoop and stirrer. I was looking at the Cozyna burr grinder as it has a winder so I know how much I have done/how much to go. I did look at the Porlex mini. So many bad reviews about the handle popping off. I could modify it and use an E-clip on the shaft so it won't come out anymore. I didn't like it as I dont know how much I have ground, unless they want you to measure how much go in instead of out as it might not hold much. 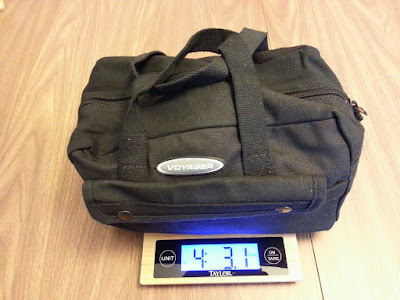 Changed to a bigger tool bag and added a small kettle for use camping/traveling near a stove.